Celebrating the life of Ulysses Smith, Jr.
Be the first to share your favorite memory, photo or story of Ulysses . This memorial page is dedicated for family, friends and future generations to celebrate the life of their loved one. 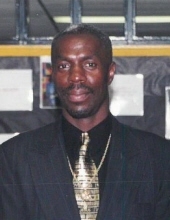 Obituary for Ulysses Smith, Jr.
Kinston- Mr. Ulysses "Bookie" Smith, Jr. 61 of 2000 Queens Road Kinston, NC; transition from labor to reward on April 02, 2019 at UNC Lenoir Health Care in Kinston, NC. Services will be held 2pm Saturday April 6, 2019 at St. Mark Church Ministries. Visitation will be held Friday from 5-7pm at Mills Funeral Home Chapel. Interment will take place at the Climent C. Mills Veterans Garden. To send flowers or a remembrance gift to the family of Ulysses Smith, Jr., please visit our Tribute Store. "Email Address" would like to share the life celebration of Ulysses Smith, Jr.. Click on the "link" to go to share a favorite memory or leave a condolence message for the family.